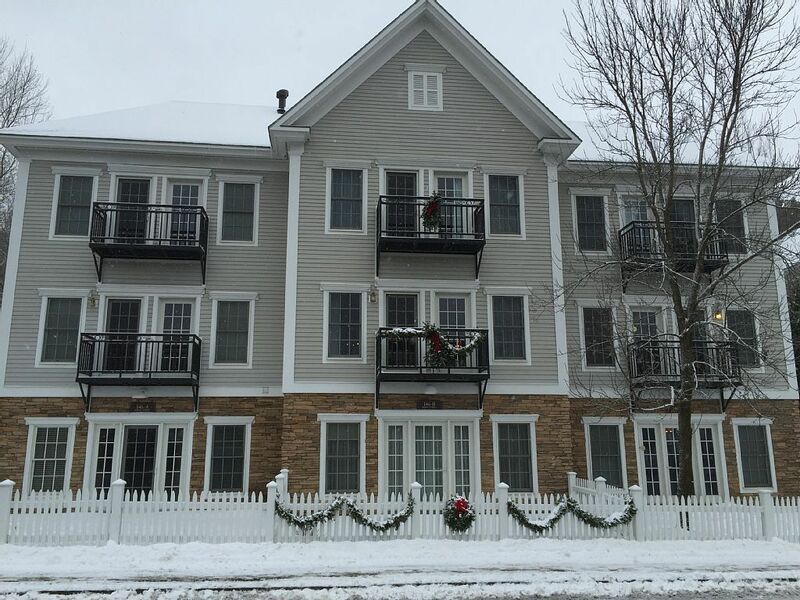 This brand new three-story luxury townhome, located in the heart of the Stowe Village, offers all the creature comforts you crave bundled up and dropped into a charming snow-covered New England village. Granite, oak, iron and maple work together to fuse luxury and charm. Whether you crave peace and quiet like cuddling up in front of a crackling fireplace or a long soak in the bubbling jacuzzi tub, this home away from home is for you. Enjoy a classic on DVD on the state of the art home theater system or access the free wireless high-speed Internet to find just the right place for a romantic dinner. Want more action, enjoy a game of billiards or a game of Texas hold-em in the 1st floor game room. More of an outdoor person? Catch the trolley just outside and hit the slopes or take a snowmobile through the pristine wooded trails nearby. No need to leave the property though, unless you want to - fully equipped gourmet kitchen lets you prepare that dinner for two or ten. There is truly something to do in each distinct season here in Stowe! Whether you come to mountain-bike through the incredible trail system or walk on the extensive nature trails, you will take in nature at its finest. If you come for the summer, you'll be able to fish, swim and boat in the freshwater streams and rivers. You might decide to take it all in from a higher perspective and take a hot-air balloon excursion as the foliage is at peak in the autumn. But don't forget that Stowe is world-famous for its winter downhill and x/c skiing - offering a huge variety of trails, ranging from beginner to expert, on Mt. Mansfield in addition to the most extensive x/c skiing trail system in the country. So regardless of the season you come in for your first time - you will be back to experience the others as well. You will be hooked on Stowe and become one of the many who come back again and again for years to come. Scrumptious breakfasts are also available within walking distance in the Main Street Dining Room of the Green Mountain Inn from 7:30 am until 10:00 am. This is a wonderful way to get energized in the morning before a full day of outdoor activities. We visited Stowe on advice of a great friend - after being there for a week alone, we fell in love with all Stowe had to offer. We decided to bring the kids and see how they felt - later on we did just that! The decision was unanimous - WE WANT A PLACE HERE in STOWE !! So we had this one built and customized it top to bottom - it has been a favorite of our vacation spots every since and we still enjoy coming as much as the first time, discovering something new each and every time we come! The decision was made to buy here in the Depot St area as its walking distance to everything - which is important, as sometimes its difficult or impossible to drive due to the heavy snowfall. This way we can walk to 6-7 different restaurants, to the Shaws General Store and all shops on Main Street as well as across the creek to the sledding/tubing hill behind the elementary school. Its just so convenient - also all the snow shoveling and salting as well as snowplowing is done for us by the wonderful association team - what a relief !! Looking back - it was the best decision we could have made - walk to everything and a 10 min drive or shuttle ride to amazing skiing !! Its so wonderful to walk out the door and have access to all you need without getting in your car (whether its to take in the spectacular winter wonderland or the amazing autumn vistas and leaf-peeping). A stones throw away you have the grocery store, pharmacy, shops, restaurants, museum, general store and cafes. The vistas all around Main Street are breathtaking and picture spots abound. You are about 15 min walk from a spectacular waterfall and the old Tubbs snowshoe factory on Rt. 100. Two full bathrooms available in the main bedrooms on the top floor. A full bath is also available in 1st floor (Playroom) and a 1/2 bath on 2nd floor for guests. From the balconies you can also see Main Street and the church steeple on Main street. Its walking distance from our home - maybe 300-400 feet. Stowe Mountain Resort is a one-of-a-kind ski lodge, making you feel like you're in Breckenridge... again its accessible from our back door by free shuttle. In the Center of the Stowe Village - Walk to Restaurants, Shops, Museums & Sledding.. The view from the 2nd and 3rd floor balconies is of the sledding/tubing hill just across the creek - but if you look around 180 degrees you see the smaller Green Mountains. Property is rented with basic necessities (paper towel, toilet paper, soap, shampoo ) for short term rentals. Gas BBQ is available for outdoor cooking in addition to a fully-equipped gourmet kitchen with all utensils and cookware as well as service for 16 people. All small appliances are furnished to make you feel at home. All types of board games, cards, books, DVDs, flat screen TV are also available for your enjoyment while inside. Just bring your suitcases and your high expectations to have an incredible time. You will have everything that you could possibly need available or accessible in the nearby general, grocery, and drug stores which are all within walking distance. A dozen or more different restaurants also within walking distance - ranging from the corner Malt Shop to white linen 5-star dining establishments. Great first time in Stowe. Would highly recommend this home! Wonderful experience! The house was very clean, organized, and welcoming! Great location, a quick drive up the road to Stowe Mtn and the downtown area. After a long day on the mountain you can’t ask for a more cozy home to come back and relax in. We had a great time in Stowe. The accommodations were wonderful and the owners so easy to work with. I will definitely keep this place in mind for future visits! This was our second time traveling to Stowe and staying here and it never disappoints! The home is absolutely beautiful and gives our family so much space. We love being able to prepare meals right here in the home and then take a quick walk into the quaint town for some shopping. The home is clean and provides absolutely everything a family would need to make their getaway perfect. Thank you Sylvia and family for another wonderful vacation in your beautiful home. We look forward to returning again soon! It is ALWAYS our pleasure to have your family enjoy our home & all that Stowe has to offer !! Happy Holidays !! Wonderful accommodations and location! Clean, spacious and comfortable townhome. We had a fantastic experience at this property. It had everything you could need for your stay - the beds were so so comfortable and the boys loved the pool table. Loads to do in the immediate area - we are from the UK but if ever in the area again we would definitely stay again. Can’t think of anything that wasn’t perfect. Thanks for such a wonderful few days. Nestled in a snow-covered valley between the majestic Green Mountains of north-central Vermont lies the most romantic ski village you could ever imagine. ''Aspen of the East'', as it's called by many, but more cozy still, picturesque Stowe's small-town warmth and charm have beckoned to weekenders and ski aficionados galore since 1763. From luxurious 5-star spas, to a gastronomic cornucopia in dining choices and accommodations from rural to Ritz, Stowe has got what you are looking for - come and see for yourself! The beauty is that whether you come for for winter's snow or spring's rebirth, or maybe autumn's spectacular foliage - you will be back! !